Our major cities' skyscrapers might seem obvious to us, but to birds, they are confusing and dangerous obstacles that should be avoided at all cost. Unfortunately, that isn't always possible. One simple miscalculation, a powerful gust of wind or a disorienting light could send whole flocks of birds crashing into a building's glass exterior and falling to their death. That's exactly what happens to between 600 million and 1 billion migratory birds each year in America. The majority of these bird collisions likely happen in Chicago which, according to a new study by the Cornell Lab of Ornithology, is the country's busiest avian airspace during migration. Around 250 species, totaling up to 5 million birds, flutter through the city twice a year during migration season. And this year's Spring migration is right around the corner. The journey is dangerous by any measure. The birds must deal with predation and exhaustion, but Chicago's jutting skyline makes it even more treacherous. One local group, charged with cleaning up the aftermath of these collisions is the Chicago Bird Collision Monitors. In the 1-square-mile downtown area alone, they collect an astounding 6,000 birds annually, the death toll through the rest of the city could measure into the tens of thousands. The city produces the most light pollution in the country, and the light confuses migrating birds that usually make their journeys at night using the stars as a guide to reach their destination. When buildings leave their lights on at night, the birds can become disoriented often crashing into the glass exteriors of Chicago's structures. Some buildings, like the McCormick Place Lakeside Center, have become infamous for their bird body count. 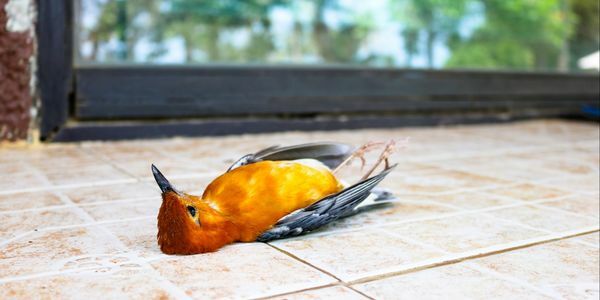 According to the Field Museum, McCormick Place has been responsible for nearly 40,000 bird deaths over four decades — they have since taken measures to cut down on bird collisions. Chicago already has some bird collision mitigation programs, but most of them are voluntary like the "Lights Out" program which asks building operators to turn off their lights after 11 pm during migration season. While these measures have helped, the city's location in the middle of the migration thoroughfare means that they must do more. One of the easiest and most responsible ways to ensure tragedies like these don't happen is to make the "lights out" policy mandatory during migration season, not voluntary. This method is proven to reduce collisions and it also saves energy. It's time for cities like Chicago, that lie in the flight path of migratory birds, to take the well-being of our nation's migrating birds into consideration and take measures to ensure they reach their final destination. Sign the petition and ask the city of Chicago to require buildings to turn off their lights during migratory bird season.